The Mitox 271-MT represents fantastic value for money – 4 high quality tools, powered by a full crank 26cc engine, all for an unbelieveable price. Mitox tools offer great quality and value, and the 271MT is no different. 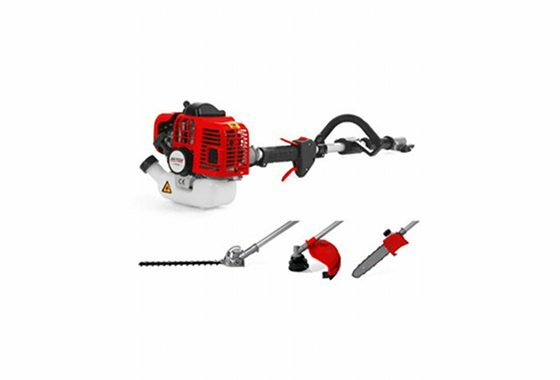 The tried and tested Mitox 26cc engine can be attached in seconds to a hedge trimmer, pole pruner, grass trimmer or brushcutter head, by a robust aluminium quick lock coupling. With only one engine to service and fuel, plus practical storage, the 271-MT offers an ideal solution to complete garden maintenance for domestic users. Full Crank Engine: All Mitox machines are powered by full crank 2 stroke engines, providing high performance and reliability at an unbeatable price. Aluminium Coupling: The robust aluminium quick lock coupling enables attachments to be changed in seconds, with a high quality construction ensuring long life. Versatile: 4 tools in one machine – a 40cm articulating hedgetrimmer, 10″ pole pruner, grass trimmer and brushcutter – with one full crank engine to fuel, store and service.